Facing off against a predator requires intelligence some of the time and physical ability the rest of the time. Knowing when to use which trait is almost always a split-second decision, but when faced with Xenomorphs it's generally a good idea to just run as fast as you can. There's a lot of running in Aliens: Life and Death #1 from Dark Horse Comics. The issue is written by Dan Abnett, illustrated by Moritat and colored by Rain Beredo. In the aftermath of the battle with the Engineers, the surviving humans on LV-223 are wounded and scattered—and easy prey for a gathering horde of Aliens! The Colonial Marines get a taste of what it’s like to be at the bottom of the food chain! The formidable Xenomorphs are terrors within the galaxy and Abnett opens the issue showing the reader why. In fact, much of the issue is very frenetic in its pacing that drops the reader right into the thick of a battle and doesn't really let up from there. Abnett uses this very effectively to create an atmosphere of chaos and tension, but it does have the drawback of offering little in the way of story. That's not to say that Abnett doesn't manage to work in some bread crumbs to tease where things are going, but Aliens: Life and Death #1 does feel a little light on the narrative with the characters constantly on the run. The issue's ending is probably the biggest narrative reveal in the entire issue and does a good job of at least piquing the reader's interest from a plot perspective. Moritat's style is just as frenetic as the action on the pages. The characters are very expressive and accentuated with thick, bold lines to emphasize their presence against sparsely illustrated backgrounds. The opening pages are lent a handicam feel to them as Moritat moves the soldiers through a retreat as Xenomorphs pick them off one by one. It's an artistic approach that's sort of rough and tumble overall, but Moritat makes it work very well. Beredo's colors are dark and moody, further contributing to the environment of terror. 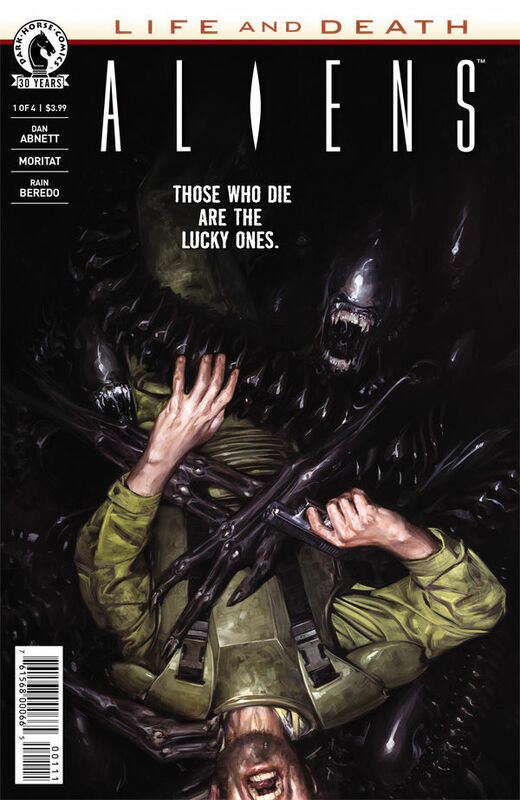 Aliens: Life and Death #1 has a little bit of everything that allows it to do well in the Alien universe. The Colonial Marines can never seem to catch a break and the action in the issue ensures that won't change any time soon. Abnett enjoys writing cosmic tales and he imbues Aliens: Life and Death #1 with that flair--accompanied by lots of Xenomorphs eating people. The artwork by Moritat is scattered in a way that works very well for the issue's direction. Aliens: Life and Death #1 is a pretty breezy read that will make the reader feel like maybe they should be running alongside the Colonial Marines. Aliens: Life and Death #1 is in stores September 21.